I urge you to give the Vista Event Viewer a chance to impress. Make a resolution to visit the interface at least once a week. Then should disaster strike, your experience will give you a baseline of what a healthy machine looks like. Moreover, any exceptions will stand out and you will know how to drill down and find the crucial troubleshooting information. To get started, click on the Vista Start button, then in the ‘Start Search’ box type just three letters: eve. 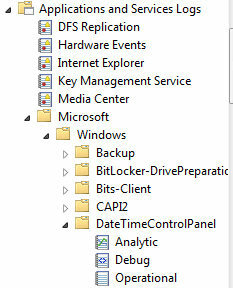 Observe how the larger dialog box displays: ‘Programs’ and underneath: ‘Event Viewer’. 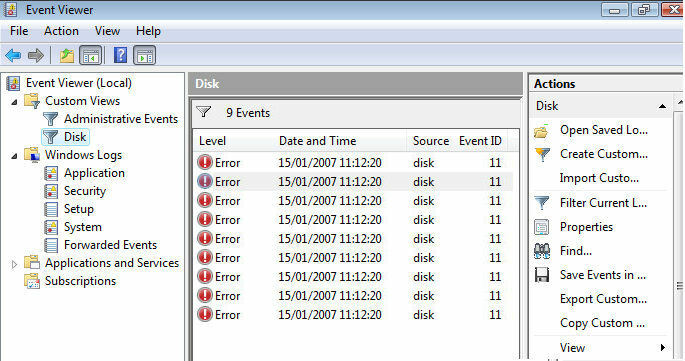 Click on ‘Event Viewer’. Alternatively, you could type the full word ‘event viewer in the Start Search dialog box and then press enter. In Vista there are still two or even three ways of performing most tasks. As with so many Vista features, Microsoft has improved the Event Viewer compared with its XP predecessor. What particularly impressed me was the slick organization of the vast amount of troubleshooting data. Everywhere you look, from the 3 pane layout, to the categories in Applications and Services Logs, it’s obvious that Microsoft has invested considerable effort in researching what people want and then delivering the information to troubleshoot specific Vista events. Vista has added two new logs to the Event Viewer: Setup and Forwarded Events. To find these menu items, look in the left hand pane underneath ‘Windows logs’, in amongst the familiar: Application, Security and System logs are the two new logs, Setup and Forwarded Events. There are also yet more logs, in fact there is a whole new world under ‘Application and Service Logs’. In this section each application or service can have up to four sub-categories of logs. Admin: Printers give more than their share of problems, make sure you look in the corresponding Admin log if your printer is not working properly. Operational:Like the Admin logs, the operational logs are also useful for discovering what happened to faulty print devices, for example, why has a printer disappeared from the network. Debug: This log is designed for experienced troubleshooters and developers who are trying to debug a particular problem. Logging in itself causes a load on the processor consequently these intensive logs are disabled by default. Another reason is that ordinary users maybe confused rather than helped by their output. 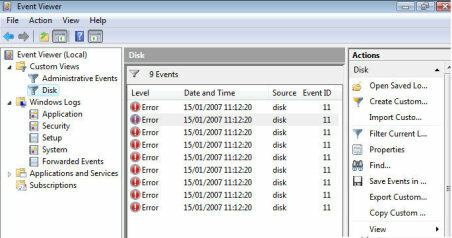 My aim in this section is to give you specific examples of what you can achieve with the new Vista Event Viewer. I recommend that you create views of events across multiple logs, for example create a Custom View of all events containing ‘Event Sources: Disk’ in either the System or the Application log. Incidentally, custom views for events reinforces techniques you may have learnt in the new Vista Explorer Searches, both create virtual folders of just the filtered information that you need. Also both use XML to organize their data. a) In the console tree, navigate to the log that contains the event you want to associate with a task. b) Right-click the event and select Attach Task to This Event. c) Perform each step presented by the Create Basic Task Wizard. Note: if you get an Access denied message, see elevated privileges above. In my opinion, the biggest problem with previous Windows event viewers is that when the computer did not do what they want, people, including me, forgot to search the logs for clues. The bottom line was that XP’s event viewer was not sufficiently eye-catching, interesting or useful to hold a troubleshooter’s attention. Vista rectifies this fault by developing the event viewer into a console, where it’s easy and enjoyable to discover what is, or is not, going on under the covers of your Vista machine. As a bonus, by regularly visiting the Event View, you will be alert to problems before they become critical. For example; disk bad sectors may start in harmless areas, with vigilance, you could take action before critical boot sectors are affected. # PowerShell script to enumerate the event logs. Note 1a: -list is correct, please note that you really do need that dash to precede a PowerShell parameter. Note 1b: What I find is that PowerShell helps you discover more about the Event Viewer, and interrogating these logs is a great reason to learn PowerShell. See more on PowerShell Eventlog scripts.